This month when Srivalli of spice your life chose chegodilu/chekodilu for the ICC, I was excited. Never made them but always wanted to and here's my chance. 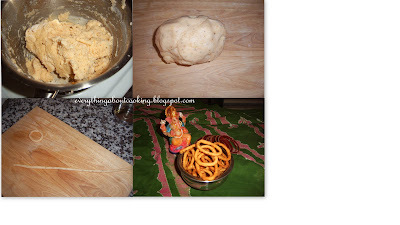 I chose the first recipe and added sesame seeds and ajwain. Also instead of soaking the moong dal, I added it to the boiling water and it was fine. Be sure to cover the dough and the forms you make with a wet tissue or something and as the recipe mentions do use a little oil to grease your hands and roll out the dough with your palms rather than your fingers. In a deep bottom pan, boil water, then add salt, ghee and moong dal. Bring it to boil, simmer and slowly add the rice flour. Using a rolling pin or the ladle, mix the flour with water by stirring it well. When the flour is mixed and done, turn off the heat immediately. Cover with lid and keep aside for 10 to 15 mins. Once the dough is cool, add chilli powder, sesame seeds, cumin seeds and mix well. Knead till you get a smooth dough. Adjust the salt and spice depending on your preference. Heat a pan with oil, enough to fry 3 -4 at time, if you conscious of not using too much oil. Simmer once it gets hot. The temperature should not be smoking hot. Grease your fingers with oil and pinch out a small lemon size ball and roll between your palms to form a thick rope. Bring the two ends to together and press to form a rope. Ensure the ends are firmed pressed as not to give out during frying. Check if the oil is in the correct temperature, by dropping a tiny bit into the oil. 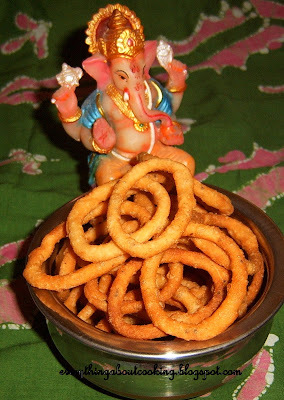 Then gently slide the rings or the chakodis in batches of 4 -5. The flame has to be on high until the chakodis come up to the surface, then lower the flame to medium and cook till you get a golden colour on the chakodis. When the chakodis are golden all over, using a slotted ladle, remove to a kitchen towel and cool. Store in an air tight container for longer shelf life. Looks crunchy. Perfect with tea! Wow! 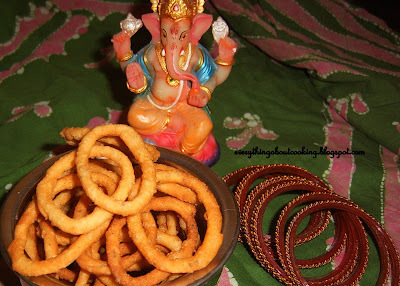 you made them the size of bangles, isn't that why they are next to the delicious chegodis? Those look yummy! Very nice blog you have and congrats on the foodie blogroll!